Join us at Ramada by Wyndham Texarkana for comfort and convenience along the Texas-Arkansas state line. Plan your next special event or business meeting with us. 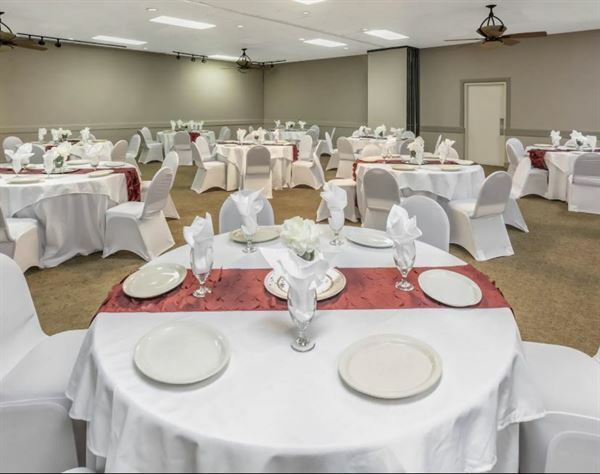 Featuring 2,400 square feet of event space, our hotel offers three meeting rooms that accommodate up to 200 conference guests or 150 banquet guests. We can also arrange great rates for groups of all sizes. Garrison Gardens is an outdoor garden venue perfect for weddings and receptions. It is located minutes from Texarkana, AR, and secluded in the middle of 20 acres. There are many water features including creeks and a waterfall that add to the serenity of the ceremony site. Evening lights provide just the right romantic touch. An on-site wedding coordinator and DJ are provided for every wedding booked. Many more inclusions are included providing a relaxing day for the wedding party and their families. A beautiful bridal suite accommodates the bride and her girls and the groom's quarters takes care of the groom and his guys. Horse drawn carriage and minister are provided upon request. Young and old alike are captivated by the relaxed atmosphere and simple beauty of Holly Hill Homestead. We are known for genuine hospitality, offering a personal alternative to a hotel or motel stay. Customers comment that the food is outstanding, they feel the warmth of being treated special, and they look forward to visiting again. You will find lots to do in the Cass County area. Visit us and enjoy the beautiful Piney Woods of East Texas.